Free Body Tinted SPF30 25ml! when you spend £45 on Ultrasun! Stock up and save on your favourite products in value packs that include all the essentials to keep skin protected and safe in the sun. With double 400ml packs and our mixed size 'Little and Large' packs, you can stay protected wherever you are and get extra value! Your favourite sun care products in a supersized bottle that's great for all family and friends to share! Ultrasun Mineral range is developed with 100% mineral filters to block UV, protect against blue light (HEV) and deliver anti-ageing properties with revolutionary Ectoin. Free from perfume, mineral oils, PEG/PPG emulsifiers, silicones, preservatives and chemical filters. Delivering medium-high UVA/UVB protection, the Family range is ideal for very sensitive and children's skin, helping to protect against 'prickly heat' reactions. The Sports range is ideal for all outdoor, watersports and gardening enthusiasts. It is especially suitable for use on the scalp, or for thinning/receding hair. Combining UVA and UVB protection with powerful antioxidants, the Face range restores optimal moisture levels, and reduces the appearance of wrinkles. 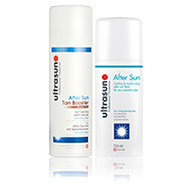 Ultrasun Aftersun is a fast-absorbing, non-greasy after-sun gel to cool and soothe sun-exposed skin for up to 24 hours. The Tan Activators are ideal for stimulating the production of melanin and activating the natural tanning process. The Glimmer range adds a subtle shimmer finish to skin whilst providing medium to high UVA/UVB protection to all skin types - including very sensitive! The Extreme range offers long-lasting high sun protection that is ideal for extreme sun conditions and extremely sensitive skin. From lip balm to hand cream, keep your skin protected in the sun with these holiday must-haves! Discover your personal sun account from Ultrasun and find out how often you need to reapply Ultrasun! 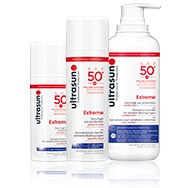 Shop all Ultrasun products to find the right sun protection for your skin! Over twenty years of sun-sational success. Launching in 1992, with the unveiling of its Transparent Sports Gel, Ultrasun kick-started with innovation at its core. Building the brand with further revolutionary sun protectants, including the first ever liposomal-based lotion protection products, Ultrasun continues to grow in strength and breadth year on year.Ultrasun are passionate about sun care and protecting your skin from the harmful effects of over-exposure to the sun’s rays. Just one application of Ultrasun protection daily delivers long-lasting high level protection from both UVA and UVB rays. 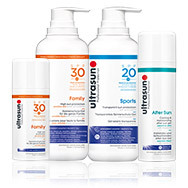 Follow Ultrasun’s sun account chart to find which SPF you should be using! 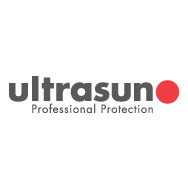 Find all you need to know about Ultrasun with our handy FAQ’s! Hermione Lawson shares her expert advice to stay safe in the sun! Ultrasun is committed to sun protection innovation; ensuring all skin types are catered to, all Ultrasun creams and Ultrasun lotions are free from oils, emulsifiers and perfume, reducing the risk of allergy and ensuring they’re especially suitable for children and those with sensitive skin. 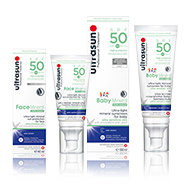 Family friendly too, the Ultrasun Family range includes an array of SPFs to prepare and protect your body from damaging UV rays, with a super-sensitive formulation which is also ideal for children’s skin, helping to protect against ‘prickly heat’ reactions. 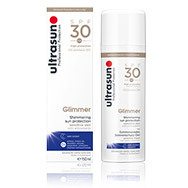 Ultrasun offers high UVA/UVB protection with just one application a day and ensures vulnerable areas such as shins, noses and shoulders are protected, while the Tan Activator range also works to stimulate the production of melanin, activating the natural tanning process to help you gain a gorgeous glow, safely. Winners of multiple awards, including ‘Best New Sun Care Launch’ for Face SPF50+ in 2012, Ultrasun’s high-tech packaging innovations, skincare benefits and high UVA/UVB protection makes it the expert in sun protection. Remember to always apply sun protection generously 15 to 30 minutes before sun exposure. Any less radically reduces the protection effect. Even sun protection with high SPF does not grant full protection. Keep babies and young children out of direct sunlight and protect them with a high sun protection factor (over 30spf) and appropriate clothing. For more detail on how you can protect your skin in the sun, and to discover how often you personally need to reapply, check out your personal sun account from Ultrasun.